How to spend 2 weeks in Thailand when you’re not living in a secret community on a hidden beach. I had to make at least one reference to The Beach didn’t I? Forgive me. If you’re like me and, you’re taking as much annual leave as you can get away with in one go without quitting your job then you’ll likely have two weeks. 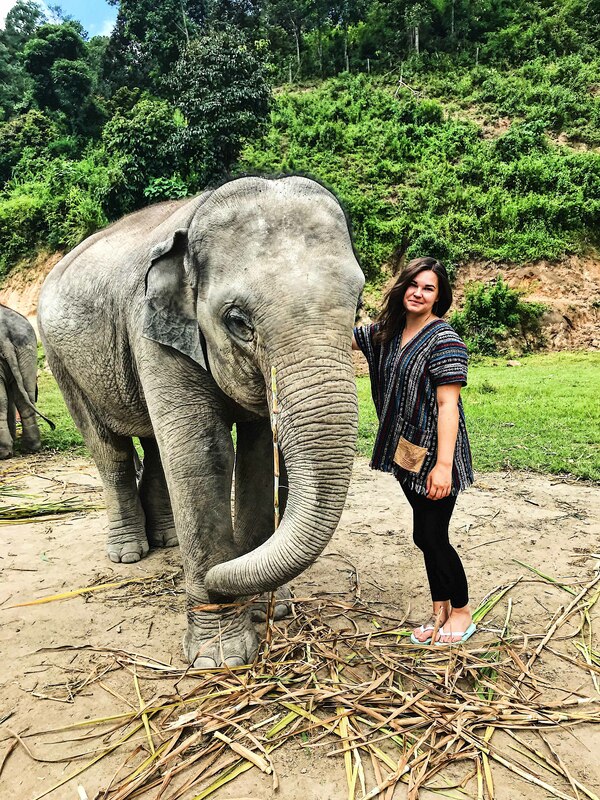 Sadly, two weeks is definitely not enough to conquer Siam, but these 2 weeks in Thailand will leave you wanting more, more, more. I’m assuming that you’re using the weekend to travel on so, we’ll be starting on a Saturday and returning on a Sunday. The following two week itinerary is based on my own experiences, where I’ll also advise on what I would do differently. It’s worth noting that, the infamous Full Moon Party fell on the day we arrived in Thailand so of course were going to add on another five hours travel to attend! This is why our two weeks in Thailand began at Koh Phangan. Our first day was quite honestly just 24 hours of travel – finally arriving in to Bangkok at 7am on the Sunday. We left London at 9am the day before. We had a couple of hours before our internal flight to Koh Samui that departed at 11:40. We arrive at Koh Samui at 12:45pm, hopped in a taxi to Big Buddha Pier. We had around four hours until our 4pm ferry, so we grabbed a bite to eat and a well-earned rest while we waited. We finally arrived at Koh Phangan around 5pm and checked in to our pre-booked hostel. 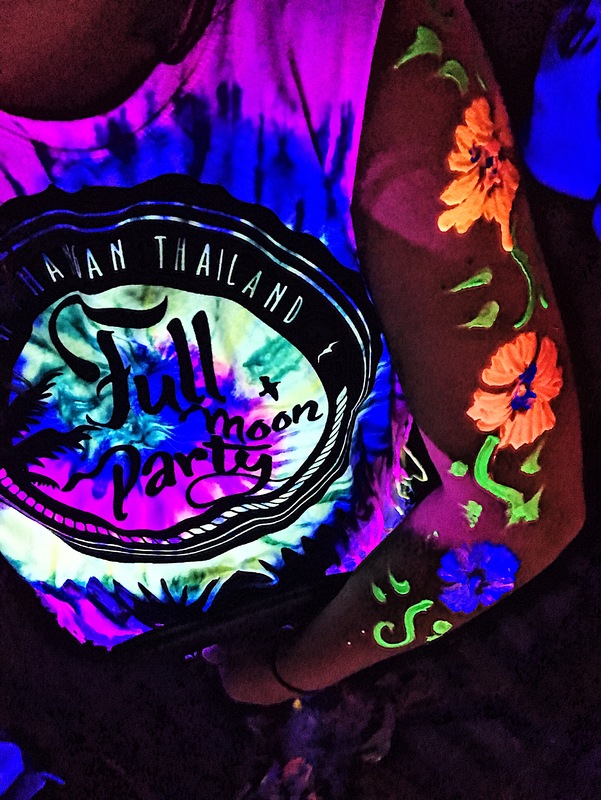 Personally, had the full moon party not fallen on the date of our arrival then we wouldn’t have even visited Koh Phangan – favouring a visit to Phuket or even more time in Koh Tao. Surprisingly, we still managed to wake up before the afternoon (actually about 9am) so given the extra effort it took to reach the island, we decided we actually wanted to see some of it! So we caught a taxi to the park, and hiked up Phaeng Waterfall and the view point. 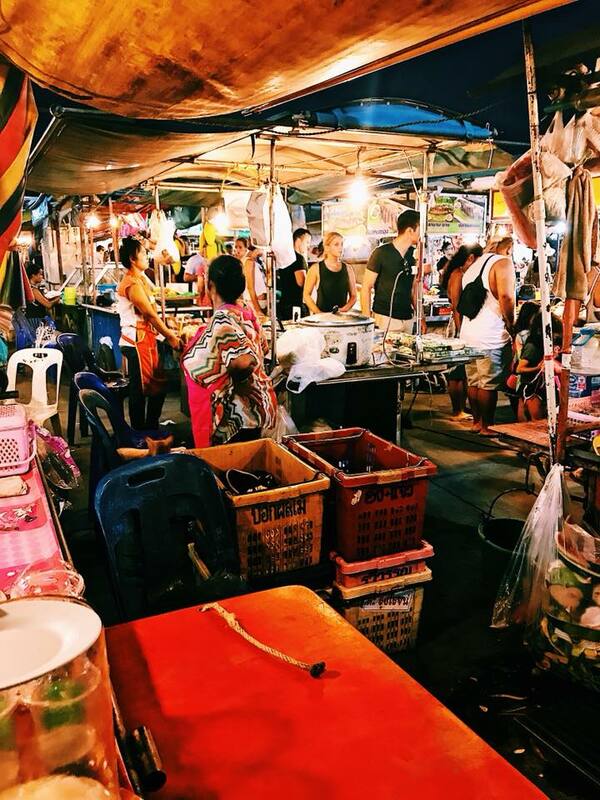 Later we headed over to the Thong Sala Night Market for some delicious street food and perused some of the markets. Today was an early start with a 8.30am ferry to Koh Tao, luckily it was only around an hour. We arrived in to Koh Tao around 10am and checked in to our accommodation which was located right on the beach – hurray! 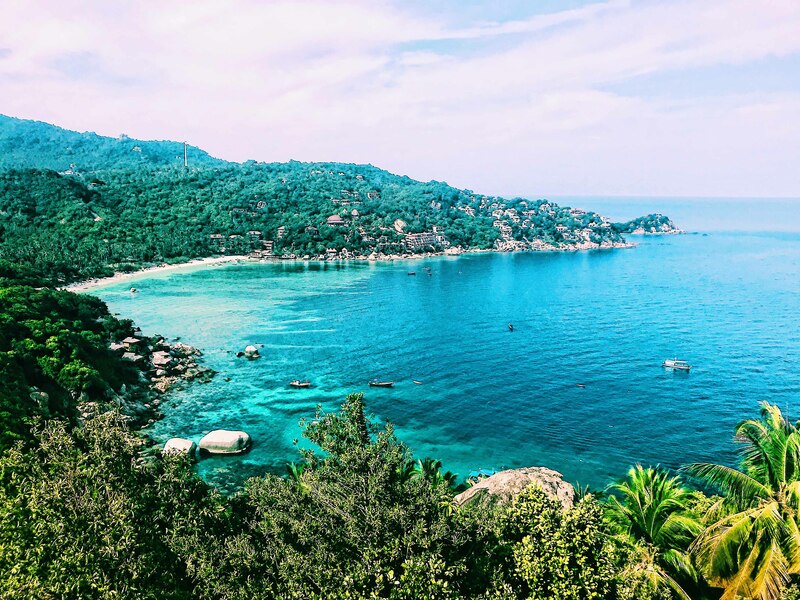 The original plan was to Charter a Long Tail to Koh Nang Yuan, but actually what we did was sit in a cute little book cafe for a while, before hiking to John Suwan viewpoint. On our way back we stopped by Shark Bay to let the little fish nibble our feet, with some beach side refreshment in the way of thai green curry and cocktails. To end the day, we treated ourselves to a massage. Today was scuba diving day! 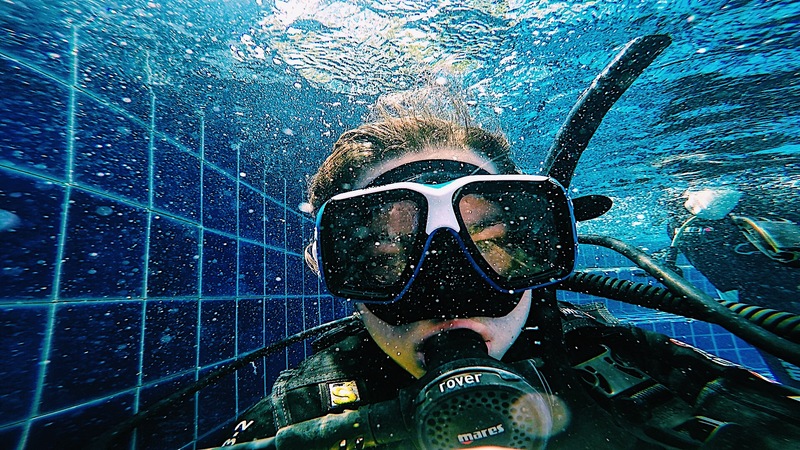 As complete beginners, we completed a one day PADI Discovery Course with Crystal Dive. I’ll write my experience up of this in a separate article, but I highly recommend scuba diving on Kao Tao – supposedly the cheapest place in the world! Today was a bit of a killer, a ten hour journey to reach Koh Phi Phi which involved three ferries, a bus and a taxi. We eventually reached Koh Phi Phi at 4.30pm, checked in to our accommodation on arrival and didn’t do a fat lot else. 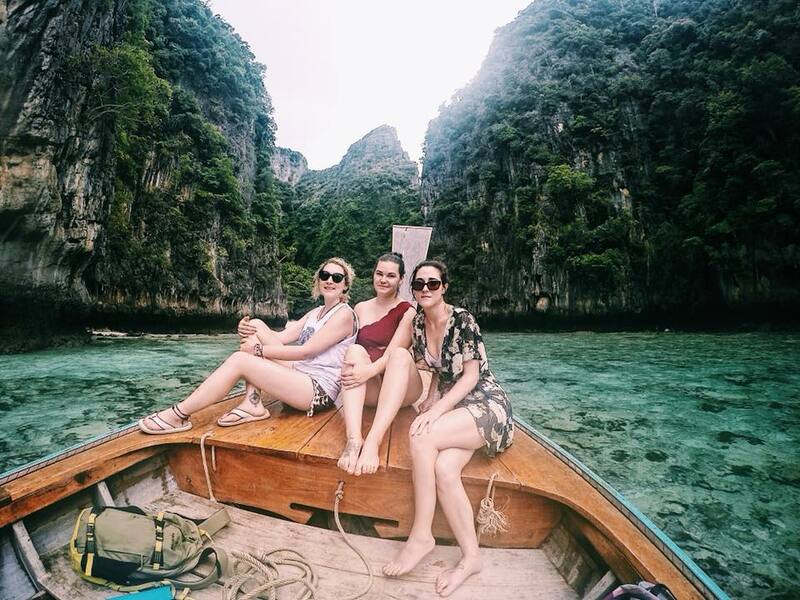 This was one of my favourite days in Thailand, and it involved Mr Chet, a Longtail Boat and absolute paradise. 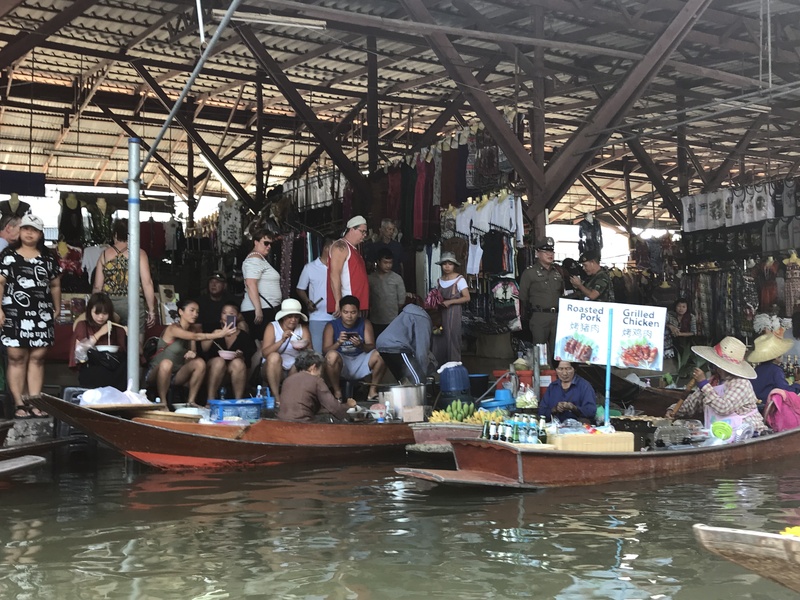 While other tours were available, what drew me to Mr Chet’s Tours were not only the fantastic reviews, but the authenticity of the trip on a Longtail boat. The five hour tour cost 1300 baht per person including lunch provided on a beautiful secluded beach and visits to Maya Beach (although it was closed to tourist so we just came close), Loh Sa Mah Bay, Shark Point, Pi Leh Lagoon, Viking Cave and Monkey Beach. Regrettably, the boat didn’t stop on Monkey Island but I enjoyed it nonetheless. In the end, there were us three plus one other making it a very personal visit. The lunch of chicken fried rice, pineapple and drinks was absolutely delicious. The tour provided snorkelling equipment, and through the use of a Go Pro, the tour guides will happily snap photos of you and make them available to save from Facebook later on. I’d highly recommend this tour to anyone. Most of the day was spent catching a domestic flight from Phuket to Chiang Mai, which first involved a ferry to Phuket. We arrived in Chiang Mai around 4pm, checked in to our hostel and headed for a nosy at some of the markets. Today was our visit to the Elephant Jungle Sanctuary. We started the day off with dough animals (Pa Thong Ko) from Uncle Neng’s, before flagging down a taxi to take us to Wat Phra That Doi Suthep. I’m fairly certain we got ripped off here, but it’s still cheaper than a taxi in England so we won’t worry too much about that. The taxi took us one way, and it was easy enough to grab a Songthaew back since they line the streets outside. Pay attention to some of the monks within the temples here, as you can take home a talisman. In the afternoon, we had intended to grab a massage as Chiang Mai Women’s Correctional Institution but we underestimated its popularity – apparently, people queue in the morning to get an appointment that day! Oops.. Lunch then? Plan B was to head to Wat Chedi Luang and participate in some Monk Chats. We sat in the clearly identifiable area (tables and chairs under a marquee labelled ‘monk chats’) for some time before we called it quits. But as we headed off we noticed a lone monk chatting to some other tourists, and we decided to join in. 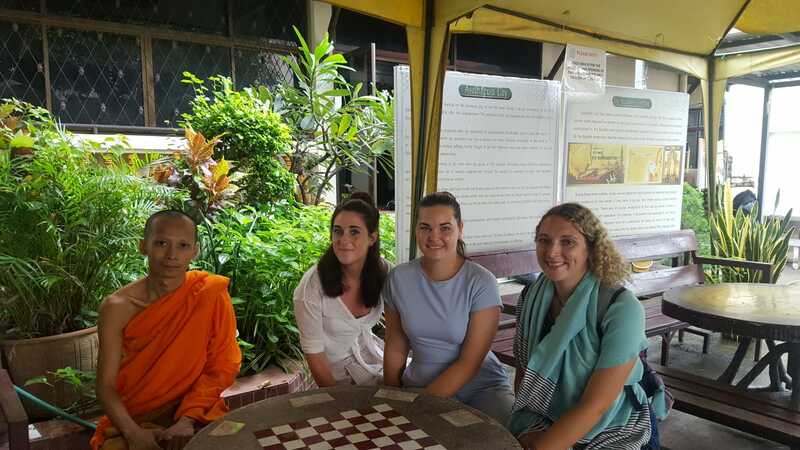 A monk chat was high on my bucket list for Thailand so I was so grateful that we got to experience it. For our final day we really wanted to do a hike. Having experienced a home stay in Vietnam, I was keen to experience something similar with tribes in Thailand. We didn’t book this in advance, so we didn’t do that much research and pretty much just walked into the first ‘tour’ shop we found the day before. 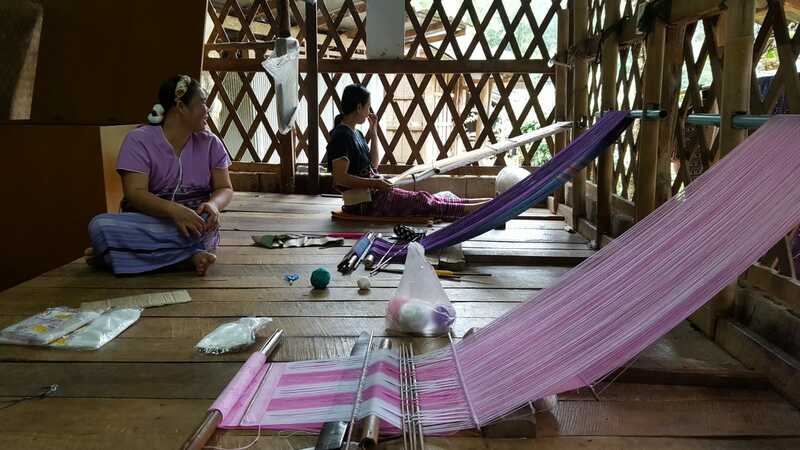 The resulting tour included the Karen Tribe and a tour of the national park inclusive of the highest point in Thailand, two waterfalls and some pagodas. The tour was fine and I enjoyed it, but really I’d have preferred to visit the White Temple in Chiang Rai or visit Pai for the day. We caught the 8am flight to Bangkok, arriving at 9.20am and immediately checked in to our hotel. 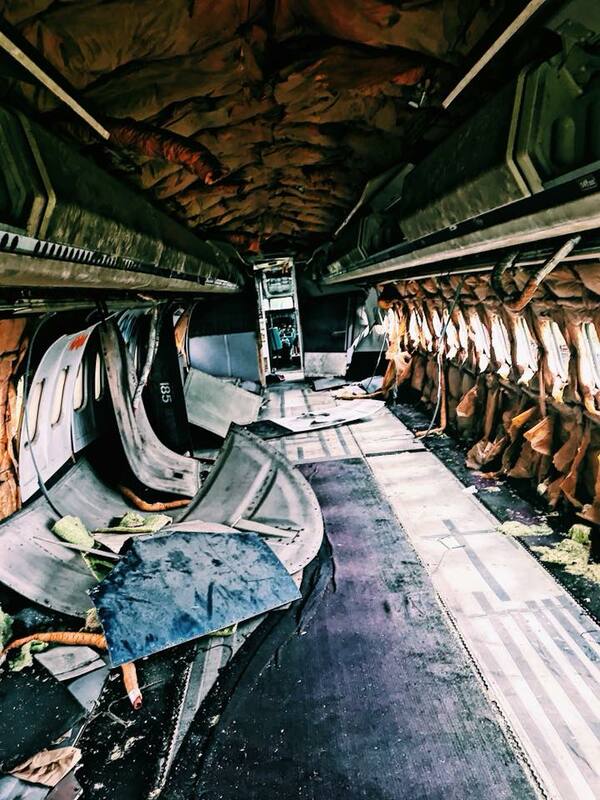 Our first point of call was the Bangkok Aeroplane Graveyard. We decided to take a bit of a chance on this since it’s run by the families that reside there, and according to prior research may or may not let you in that day. Our courage paid off. It was far easier than I imagined to reach. We rode a Khlong boat from Pratu Nam to Wat Sriboonreung (last stop) for less than 20 baht. When we departed , we simply followed Google Maps to find the graveyard. The boat was around 30 minutes, while it was less than 10 minutes walk from the boat to the graveyard. We walked up to the chained gate where a residence asked if we wanted to take pictures, and request a 100 baht fee each. Fine with us! So in we went, and we were pretty much left to our own devices in and out of the aeroplanes. 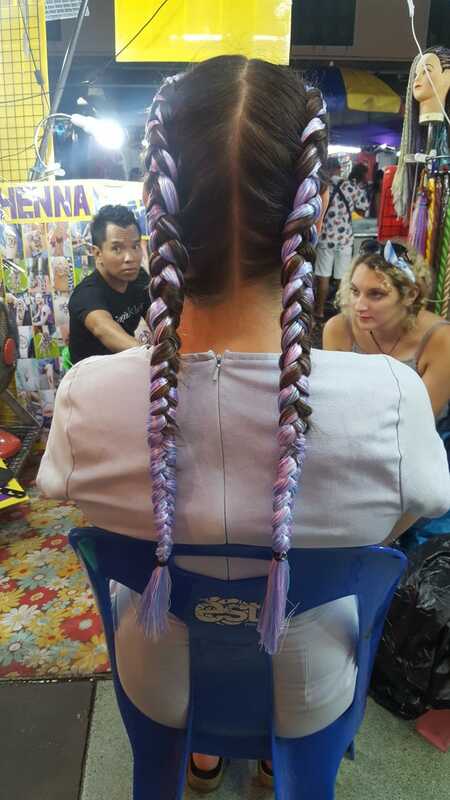 This was one of my favourite things to do in Thailand, and it cost one of the least. To finish off the day we stopped off at the Kid Mai Death Awareness Cafe, passing by a phallic shrine. Today was a temple visiting day, so we set off with intentions of visiting the Grand Palace. When we exited our Tuk Tuk, we were met with a string of ‘tour guides’ claiming we should visit Wat Arun first and hey! They had someone take us there. 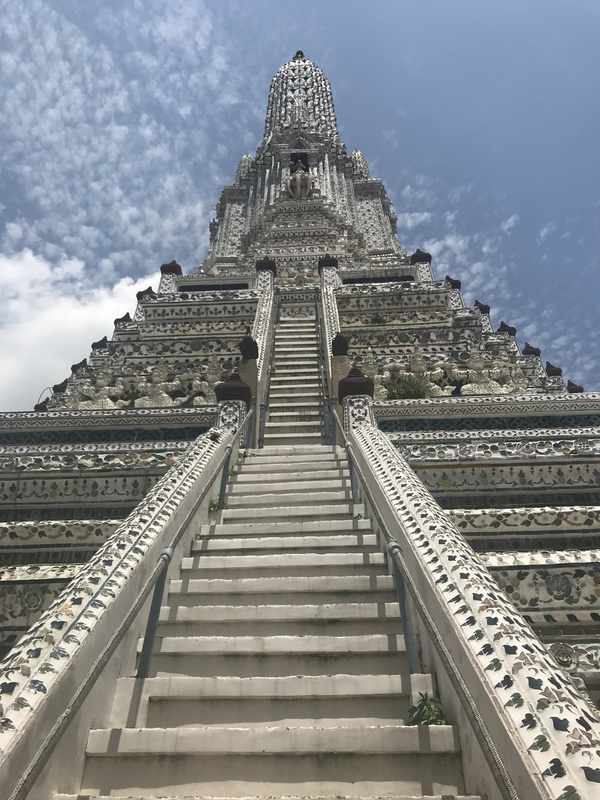 So yeah if anyone tries to sell you a boat trip to Wat Arun – ignore them. 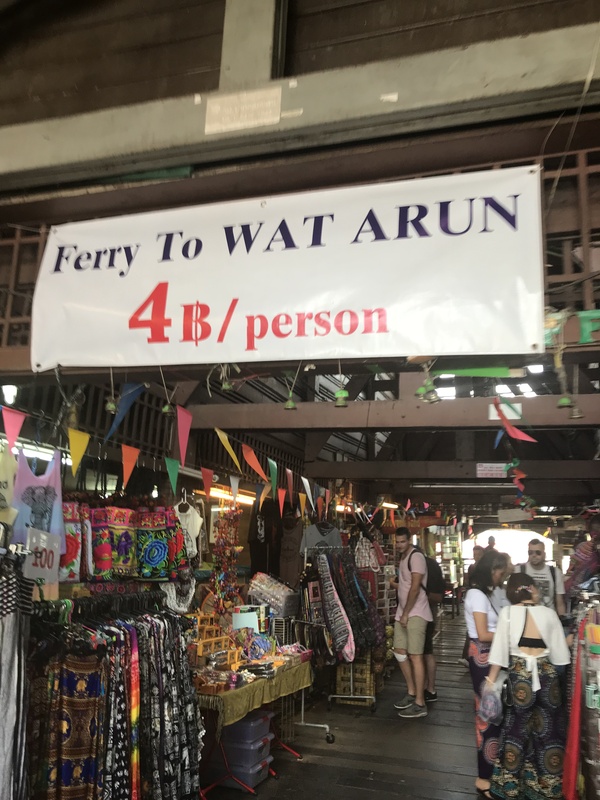 You are under NO obligation to do a tour, and instead head around the corner to catch the 4 Baht Ferry to Wat Arun instead. Catching the ferry back, we decided to walk to the Grand Palace – big mistake! It wasn’t the distance so much, as the heat and strength of the sun. Unfortunately, we didn’t have a huge amount of time in the Grand Palace, we missed the guided tour and my friend had to buy some clothing to put on as a scarf wasn’t sufficient enough cover – despite being fine in other temples. Being tired, hot and a bit grumpy – we didn’t get as much out of the visit as I’d have hoped. So, time for a change of scenery and over to Kao San Road. Arriving in the late afternoon, we wanted to experience the infamous street in both the daytime and the nighttime. We went FULL tourist with tattoos, hair extensions and henna. I have no regrets, I loved my unicorn hair! Two tattoos, one henna and a new hairstyle between us, and it was back to the hotel via Tuk Tuk. We had intended to book a tour of the train market and floating market in our hotel, but the tour guide decided he would act as our private driver instead. So for 2000 baht (total for 3 people) we had a private driver for the day. 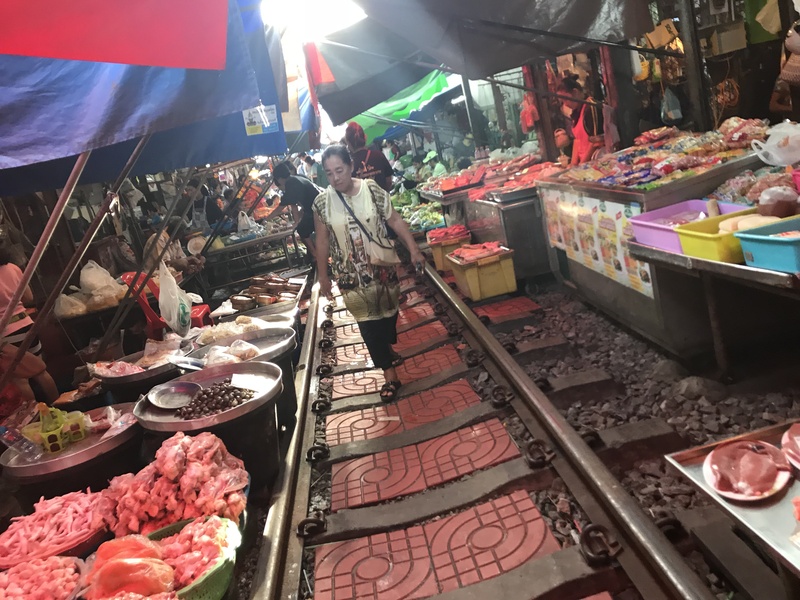 We first visited the Maekong Railway Market with enough time to peruse before the train came along. It was very hot and stuffy, mixed with the scent of fresh fish then you can imagine the kind of smells. We positioned ourselves ready for the train, and it was really amazing to see the transformation for the trains arrival. Our second stop was the floating markets and what an utter disappointment! DO NOT, I repeat, DO NOT visit the floating markets. 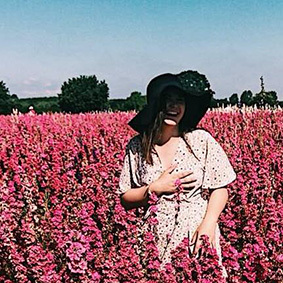 They were incredibly touristic, severe congestion and considerably overpriced – the cost was seperate to the driver. Some tourist hot spots are still worth seeing but the floating markets are not one of them. In need of some cheering up after the catastrophic disappointment of the floating markets – seriously I’d waited years to see them – we needed something bright and colourful. So what else would you do? The Unicorn Cafe of course! 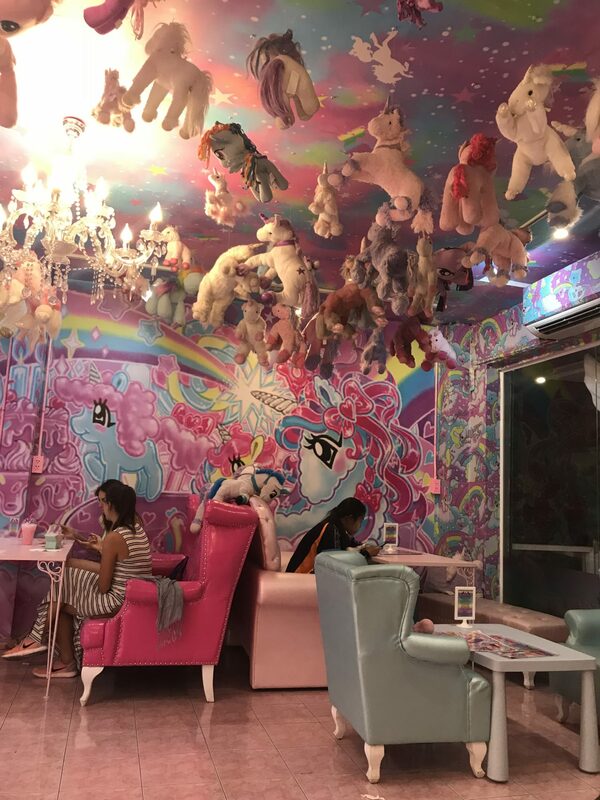 If you’re going to go to a Unicorn Cafe, you have to go FULL unicorn, so we donned the rentable unicorn onesies, ordered the unicorn hot chocolate and cupcakes and admired our colourful surroundings. After spending much of our time in Thailand in hotels and ramshackle rooms, we treated ourselves to a stay at Bangkok’s Baiyoke Sky Hotel. We chose this hotel for its revolving roof and observation decks, so we began our final morning with a quick 360 view of Bangkok’s Skyline. A further reason for choosing the hotel was its Fruit Buffet – a seasonal buffet of durian, mangosteen, raw mangoes, fresh coconut, banana, rambutan, longan, grape, pineapple, watermelon, papaya, star fruit, tamarind, orange, guava – you get the picture. 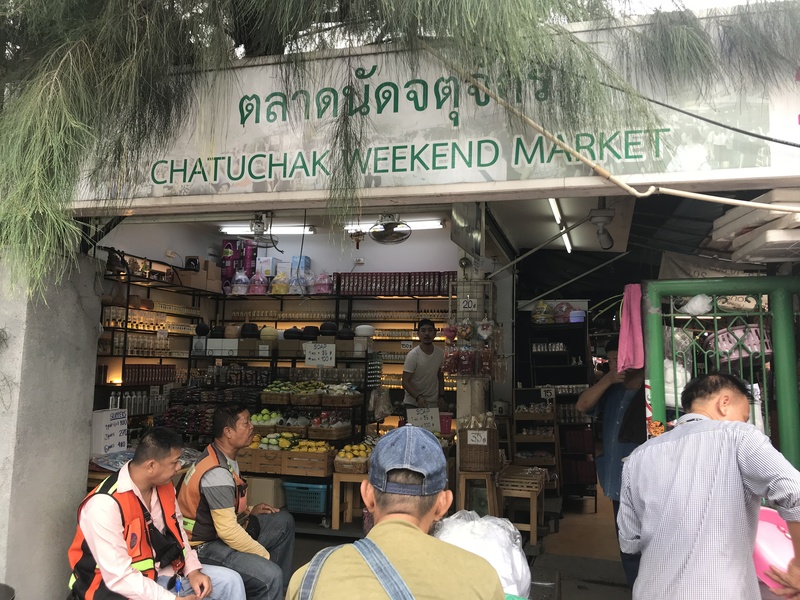 This was sustenance for our day at the infamous Chatuchak market – one of my unmissable things to do in Thailand. For those of you that don’t know, my travel partner Michelle and I each have a collectors souvenir for each trip. For me, it’s those I Heart [City] t-shirts, and for Michelle it’s Hard Rock Cafe Tshirts – but it’s considered cheating if we don’t eat there. Suffice to say, we order the same thing every time (Chicken Fajitas) and we’re yet to be disappointed. The plan is that our t-shirts will be thrifted into a t-shirt blanket. So of course it was Hard Rock Cafe for dinner! We were considering checking out some of the Soi Cowboy bards but, our courage betrayed us and we headed back to the hotel instead.